If using couscous, mix boiling water and couscous in a small bowl and set aside for 3 minutes to cool. 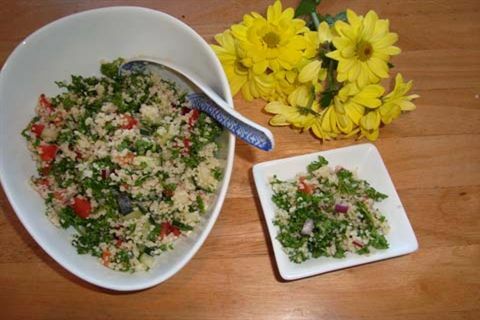 If using bulghur, mix bulgur with boiling water, cover and set aside to cool for 15 minutes. Finely chop onion, tomatoes, cucumber and parsley and place them into a big salad bowl. Add cooled couscous or bulgur, salt, pepper, olive oil and lemon juice to the bowl and mix well.